When the scripting files are properly installed in your scripting working folder, we can run some tutorial scripts. Tutorial scripts are a step by step demonstrations of usage of the scripting functionality in 20-sim. These scripts are found in the tutorials subfolder of the scripting working folder. We will start with a basic script that opens and runs a 20-sim model. 2. Open Octave (or Matlab). Note: 20-sim should be open before running the script! Note: Octave may give a cryptic "undefined near line x column 1" message, if you type the command as runsimulation instead of runSimulation! 5. Now Octave / Matlab will give a message and ask you to press ENTER to continue. The model ControlledSystem.emx is loaded into 20-sim and simulated. 6. 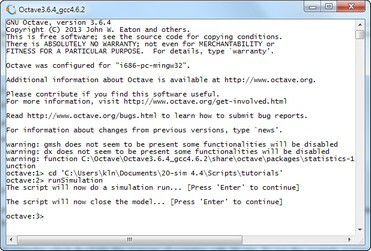 Again Octave/Matlab will give a message and ask you to press ENTER to continue. Now the simulation and model will be unloaded. To see how the script is made, you can inspect it with a text editor. 2. Open the file runSimulation.m with a text editor like Notepad. • addpath: The script starts with the command addpath('../library/xxsim'); This will enable Octave / Matlab to use the 20-sim scripting functions that are stored in the library subfolder of your scripting working folder. • xxsimConnect: This command opens a connection to 20-sim. • xxSimOpenModel: This command opens a model in 20-sim by giving the filename including the full path. • xxsimProcessModel: This command will process the model. • xxsimRun: This command will run a simulation. • xxsimCloseModel: This command will remove the simulation model from 20-sim. These functions are the basis of scripting in 20-sim and will be present in this order in most scripts. Therefore you can use the script runSimulation.m as a template for any new script that you create.